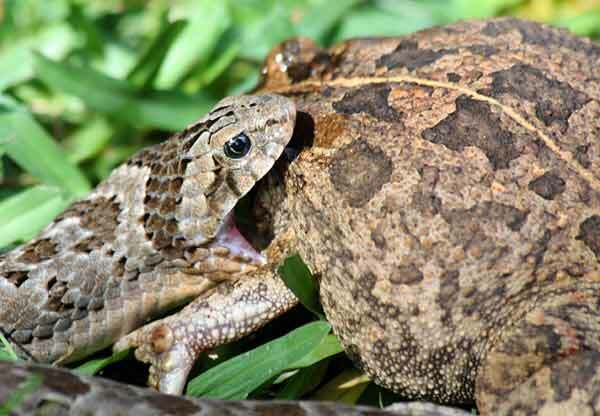 This photo sequence shows a Rhombic Night Adder (Causus rhombeatus) in the process of swallowing a frog, probably a Guttural Toad (Bufo gutturalis). 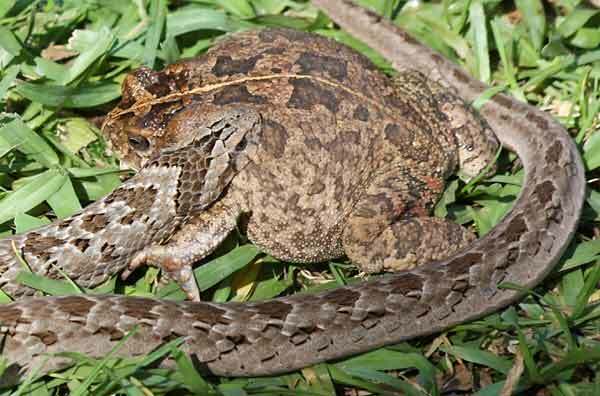 I was called to a neighbor's garden, where the night adder, with its head sideways, had clamped its jaws around the frog's rear end (above and left). At this stage the frog was very much alive, but I assume had been bitten by the snake as it seemed incapable of putting up any resistance other than inflating itself. What astounded me was the size of the frog compared to the adder's head and jaws. I had to marvel at the adder's determination and confidence that it could eventually swallow a prey of such size. 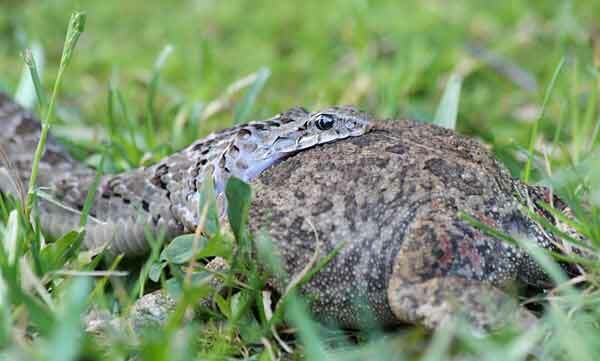 The adder, after loosening its grip, crawls over the frog which makes no attempt to escape or resist. The adder moves to the front of the frog and latches on to the side of the frog's head. 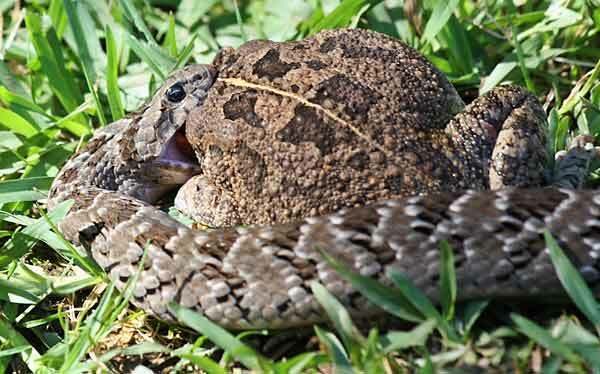 Trying to get a good grip with its jaws, the adder moves again, clamping the side of the frog's neck. 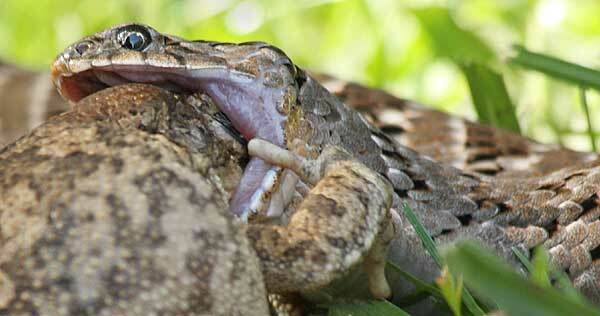 The snake manoeuvres sideways, moving its open jaws towards the frog's snout. 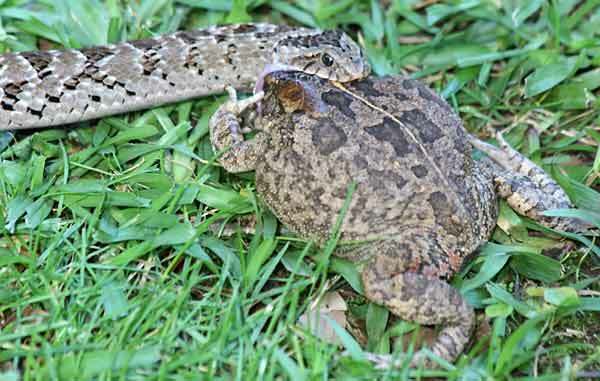 With its jaws wide, the adder forces the frog's head into its mouth, with only the frog's claw in the way. Nearly there ... the adder now has its jaws wide open over the frog's head with nothing impeding it. With the frog's head now entirely engulfed by the adder's jaws, the snake begins crawling backwards towards some nearby cover, dragging the victim with it. Here the adder can be seen pulling the frog backwards (left) and how far the frog is now in its jaws (right). The night adder dragging its victim towards thicker vegetation was a slow process and unfortunately I couldn't stay, so regrettably don't know the outcome. 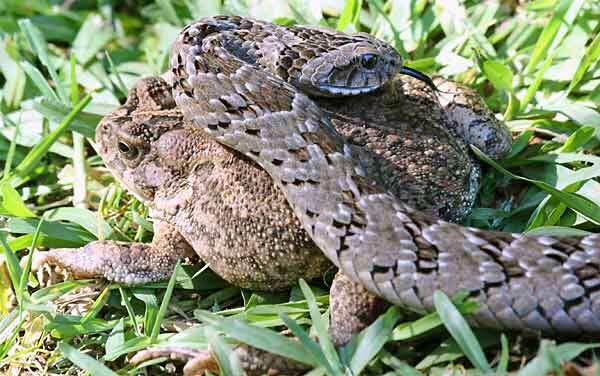 One can assume that the frog would in time "deflate" to its normal size and that the adder would eventually get it down its throat - after all, that's what snakes do. This adder is usually a gray, olive or brown colour with rhombic (diamond-shaped markings). The scales are slightly keeled (rough) and it has a distinctive "V"-marking on its head. They are, on average, about 60 cm long, but may reach up to 1 meter in length. The specimen in the photos was about 24" or 52 cm long. The Rhombic night adder carries a mild cytotoxic venom which, although non-lethal, can cause tissue damage with pain, minor swelling and some necrosis. 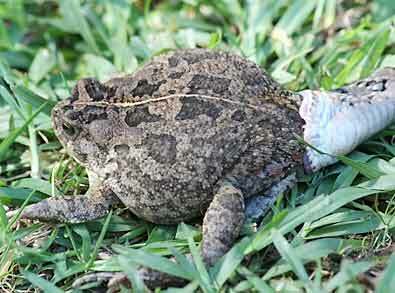 This toad is widespread throughout much of southern Africa. It has dark, irregular dorsal patches - one pair on the snout, another over eyes - and red tincture on thighs. 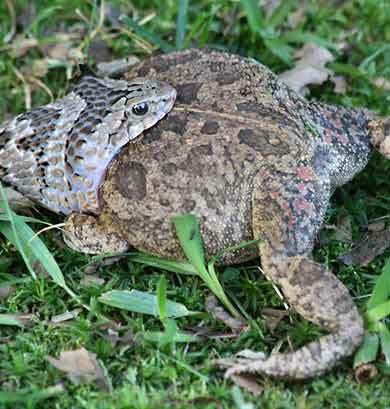 In Cape Town and surrounds, conservation groups have formulated an eradication plan as the guttural toad is seen as an invasive threat to the endangered Western Leopard toad that is endemic to the area.